Since registering for my 50 mile race at The North Face Endurance Challenge back in early April I have been trying to wrap my mind around that distance of 50 miles (80.48 kilometers). For the walker a brisk walk/jog moderate stride a mile is 2,000 steps (or 100,000 steps for 50 miles). For the runner the well known standard of measurement is the full marathon, which is 26.2 miles. 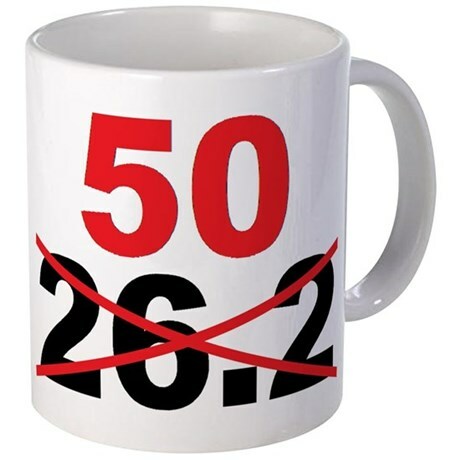 A 50 mile race would be just shy of two back to back marathons. But with this particular race, a good part of it would be run on technical trails. The North Face Endurance Challenge Series has become known a world class trailrunning and ultrarunning event. People will travel from long distances to race it. But the incredible thing is that this lone Canadian venue for the series is held in my area. 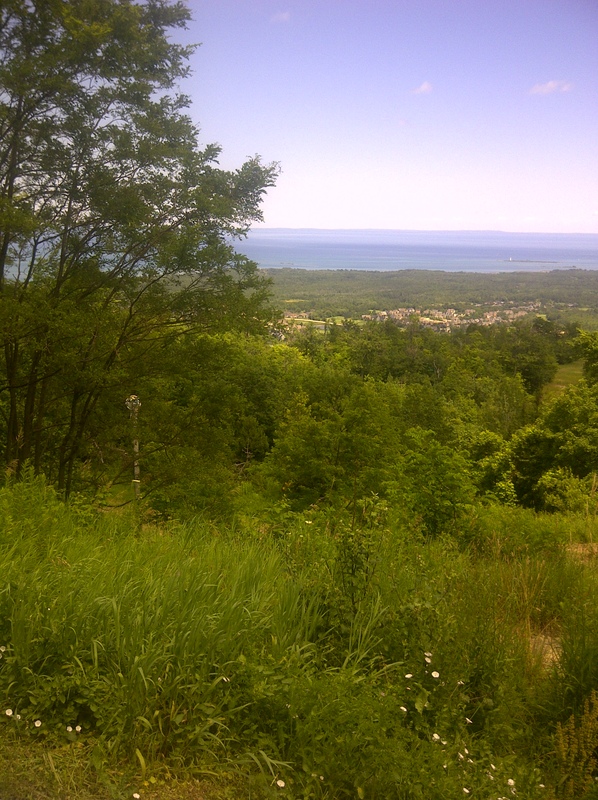 Just an hours drive to the Blue Mountains west of Collingwood, Ontario. Having raced the course a year ago in the 50k last year, I “thought” I knew what lay ahead of me. The long gruelling known escarpment climb aptly named “The Grind”, the windy and fast ski trails, technical descents, river crossings and more leg burning climbs throughout the course. 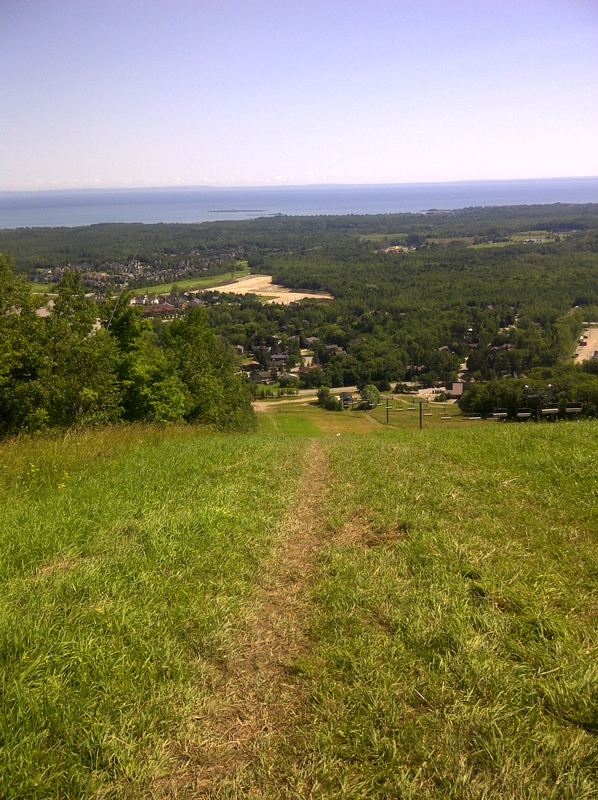 The race itself is billed as “The Most Pronounced Elevation Gain Trail Race in All Ontario”. I thought I knew the course from the previous year. For 50 miles, all I needed to do was run the course twice. The course map. Two loops totalling 50 miles. It was the same course as last year, but definitely was not the same course. I was picturing a dry course like last year, but what I faced was by far the toughest I have ever faced racing which had me so close to packing it in. But in that balancing act there are those highs. Those supports that I have before the race. And the ones that come along during the race that keep me going to the finish. I only learned about the mud the night before the race. Went back home after my bib pickup so I missed the race presentation where runners were briefed of what to expect. But a Twitter ultrarunner friend named Kristi was there, and she was tweeting me updates. The dominating item was the MUD. We have had an unseasonably high amount of rain this year. I had not properly trained in the mud and definitely was not mentally prepared for what I encountered. Last year you could run a very decent pace along this same stretch. It was a clay consistency and was so slippery. A lot of times the mud was found on the flat areas. Those places where I was making a great pace last year when the course was dry. And I was nowhere that pace on race day. The mud was demoralizing. And the hard cut-off times all of a sudden became very real to me. From the Endurance Challenge Rules it states :” All cut-off times will be strictly enforced. Runners must depart the checkpoint BEFORE the cut-off time. Runners that do not clear the aid station checkpoints within the established time limits will not be allowed to continue the race. Cut-off times can be found in the pace charts included in the distance specific course guides”. Two runners going by when I was taking a picture. Runner in front grabbing a tree to keep himself upright. Through the mud I often found myself grabbing things to keep me upright. Shrubs, branches, trees. Anything to keep me from slipping and falling. 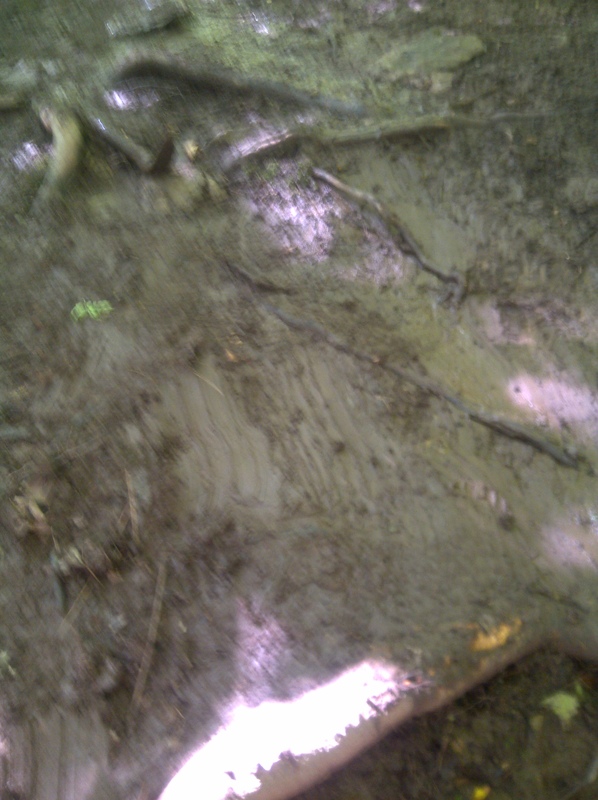 The mud had a tendency to build up on the shoes adding extra weight. I also learned it safer to plow right through the mud. If I tried to travel the fringe edges, often I would slide sideways risking injury. But sometimes the mud was also on the hills. That is when it became very tricky. Going up at times it was like two steps ahead and one step back. Going down you could take one step and then be sliding out of control. Although a bit blurry, you most likely can see how a previous runner was sliding backwards. My stomach issues have been something I have trying to work through with these long races. What to take for fuel and nutrition and what not to take. I have learned to never try something new on race day. I have also learned that for me gels are an absolute no-no (yet other runners are totally fine with them). And peanut butter sandwiches have been my trusted “go to food”. Items like M&M’s have never bothered me, so I didn’t hesitate and took a few at each of the first few aid stations. But shortly after at aid station #4, I was burping up the taste of M&M’s. Shortly after, only 15.5 miles into the race I was sick. Being sick in itself during this race did not bother me. It has happened before. But what did bother me was that it happened so early into the race. I had almost 34.5 miles (or 55.5 kilometers) to go. That is longer than any run I have done before. 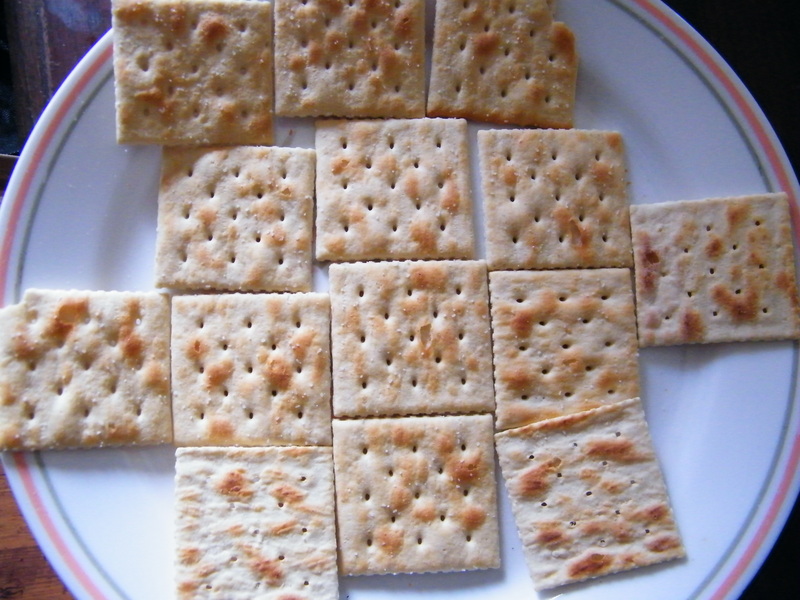 Ate some soda crackers, took a couple salt electrolyte capsules, drank lots of water. Let it settle for a couple of minutes and then worked my way to the next aid station, 4.9 miles away. Drop bags are a wonderful thing. Having them affords the runner to carry less weight. In this particular race, the drop bags were something only the 50 mile runners were privileged to use. 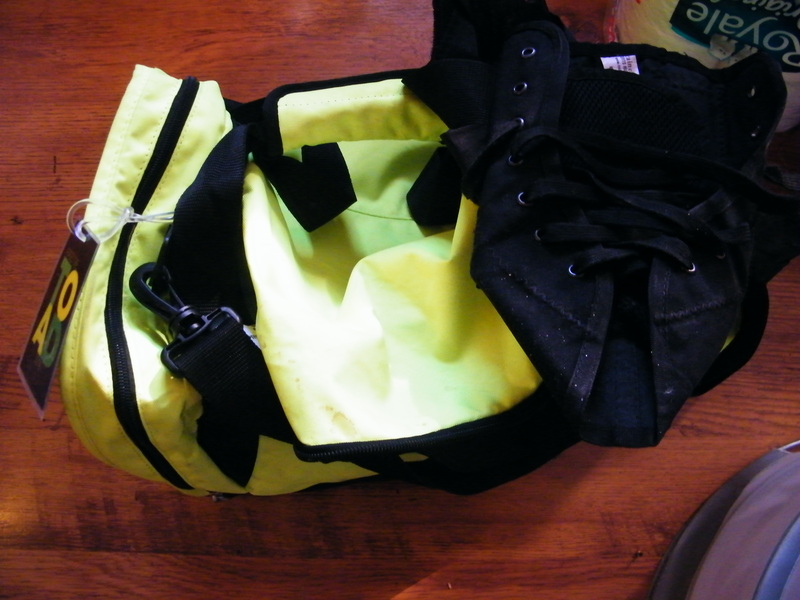 The concept of the drop bag is the runner is allowed to fill his or her bag to a maximum of 10 pounds with items you could possibly use on the course but don’t want to carry. For me it was spare shoes, dry socks, spare jersey, sun tan lotion, and trail mix and electrolyte tablets my stomach agrees with on long runs. And because I have had ankle and knee injuries, my knee brace and ankle brace were in there. My missing drop bag with the ankle brace on top back at home. There were 3 identical bags at the drop bag station. There were two times we would be able to access the drop bag which was at the Cruiser Station, the 7.5 mile mark and the 32.3 mile mark. My 1st pass at 7.5 miles I dropped off my headlamp, sprayed on some suntan lotion, grabbed some more electrolyte tablets, and pulled out my cap in case I needed it when the sun became more intense. My knee has been pretty good since I injured it my 1st year running 4 years ago. My ankle much more testy after injuring it training for my 1st marathon 3 years ago. 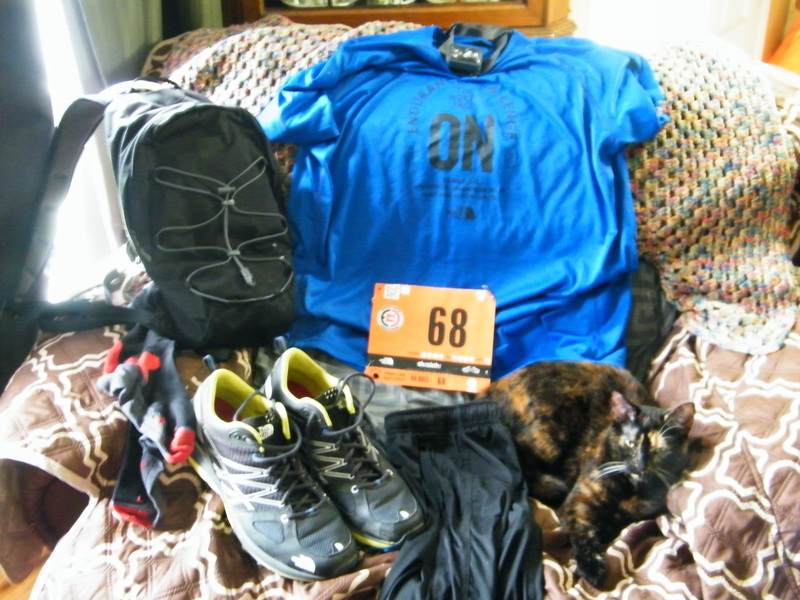 I had my ankle brace in my drop bag for my 50k race for Pick Your Poison but did not need it. In that race the ankle was fine. Not all mud and technical on the way up to Cruiser. 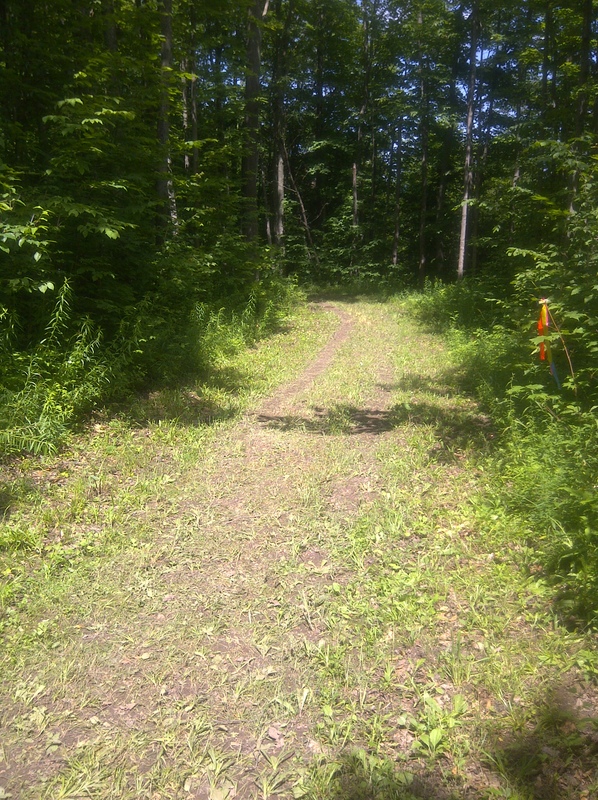 This ski trail section was nice and easy on the ankle. But coming down that final steep ski run to the half way mark my ankle was starting to “act up”. It was not a full blown sprain or anything like that, but it certainly was aggravated and was starting to swell. I needed to get back up that next 7.4 miles to Cruiser without further aggravating it much more. At Cruiser I could get my ankle brace which would provide the support that would help me make it to the finish line. A step at a time through the mud, grabbing shrubs, branches, trees for support. Up the technical hills and right back down. And one more river crossing. So relieved to see Cruiser, I paused to take a picture of the view, and then proceeded to go the area where the drop bags were. The aid station director saw me coming in what he described as me “staggering”, so he walked alongside me asking me questions to make sure I was coherent. The “staggering” was more from the ankle than anything, but I really appreciated the fact they wanted to make sure I was okay to go on. Went to go access my drop bag….and….it was not there. Starting to panic I asked “Has anyone seen another bright green drop-bag? It was a bright green just like this one here” (there were 3 identical drop bags there on my 1st loop). And then went on to mention I really needed that brace for my injured ankle. I was asked if my family could have gotten it, and I said “no”. My head was spinning. I sat down in the shade and tried to determine what I should do while the crew radioed down to see if my bag accidentally was sent back down to the base. If it was down there the brace could possibly be delivered to the next aid station. The radio call back was the vehicle had already left up the mountain. There was nothing they could do. 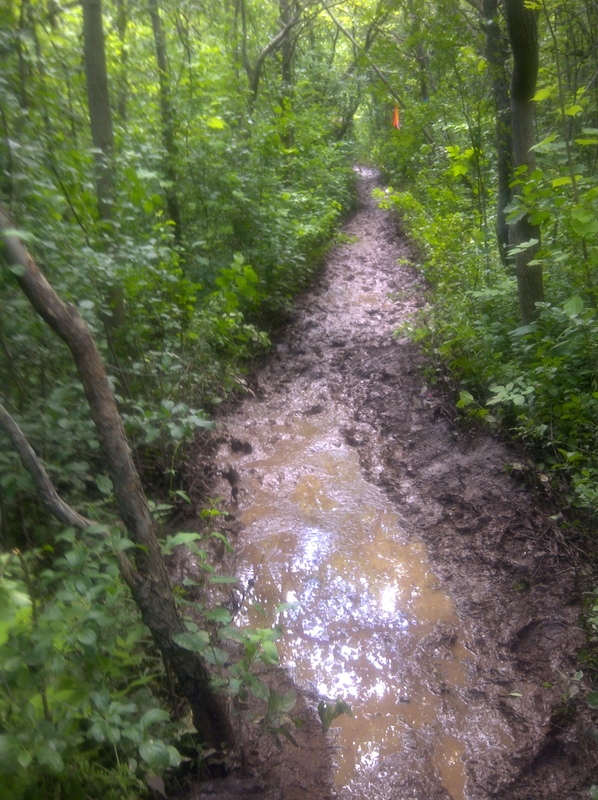 If I were to continue I knew there was a LOT of technical terrain to get to through before the finish line. This picture is a very small portion of the actual climb. I was physically exhausted, and now emotionally devastated. My wheels had fallen off. Having run 32.3 miles (or 52 kilometers) of the toughest course I have ever encountered in my lifetime I could quit now. I am 59 years and this was longest distance I have ever run. I could be very proud of that. And I sat there alone in the shade while the aid crew were apologising so profusely and asking sincerely what can they do for me. I simply said “I don’t know”. I thought of this huge billboard sign my family had set up on a busy highway for me prior to the race wishing me luck. I thought of all the people who were rooting for me. And I thought about all the races I fought through to make it to the finish. I did not want to go home with this race being “unfinished business”. Got up out of the shade, regained my composure and without looking back got back on the trail. 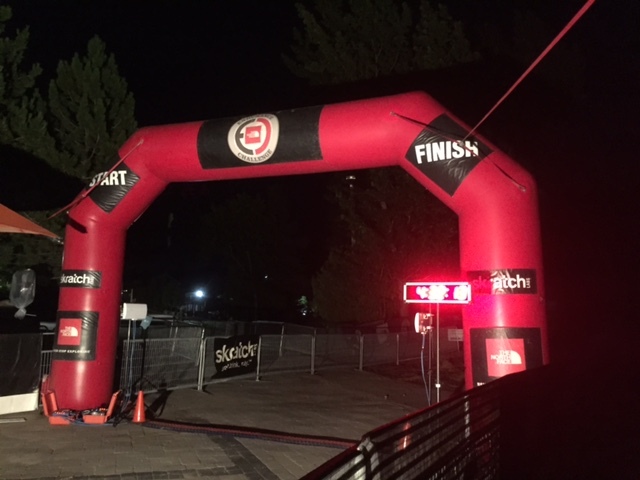 Before the 5:00 Am race start the announcer said over the PA system there were 130 fifty mile runners. There were 82 runners that finished. This race is the closest I have ever come to “packing it in”. 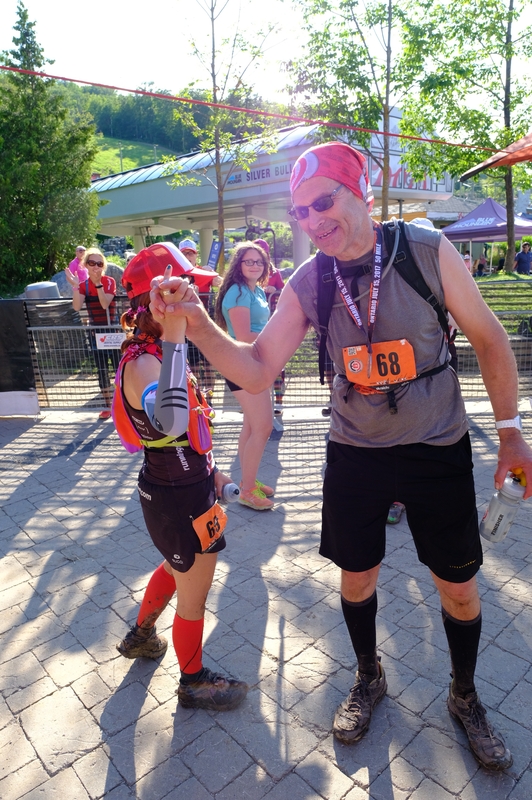 In an ultra race the runner goes through a lot physically and emotionally. The highs and the lows can be very extreme. The highs can come from much needed support before the race, and what happens during the race. I don’t think my family will ever realize what a message on a sign did for me. There has been a lot going on in my life, and I have been struggling, particularly in the area of my mental health. I had no confidence in myself. 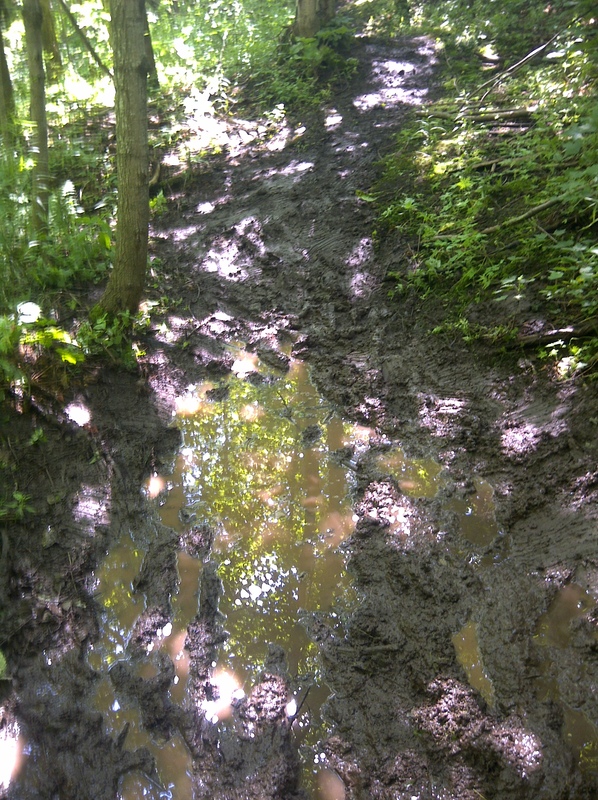 Certainly not a good setting going into a gruelling 50 mile race. This message gave me such a boost. This message on a billboard sign from the family. The sign on a busy highway gave me such a boost. Add in the mix SO many “Good lucks”, and “You Can Do This Carl” from friends, work colleagues and other runners and ultra runners on Social Media throughout the world that I have never met. It provides strength and support to “keep going, when the going gets tough”. 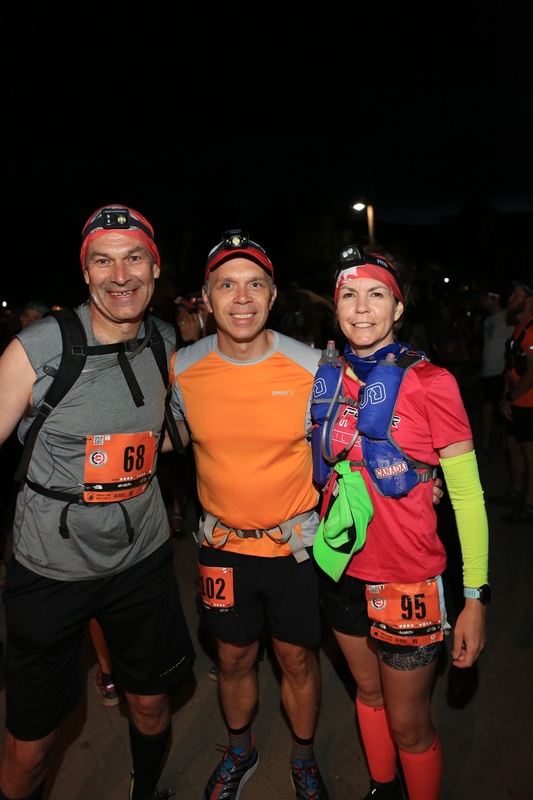 With the 5 AM start, headlamps were mandatory equipment for this race. You would be disqualified if you raced without a working headlamp. 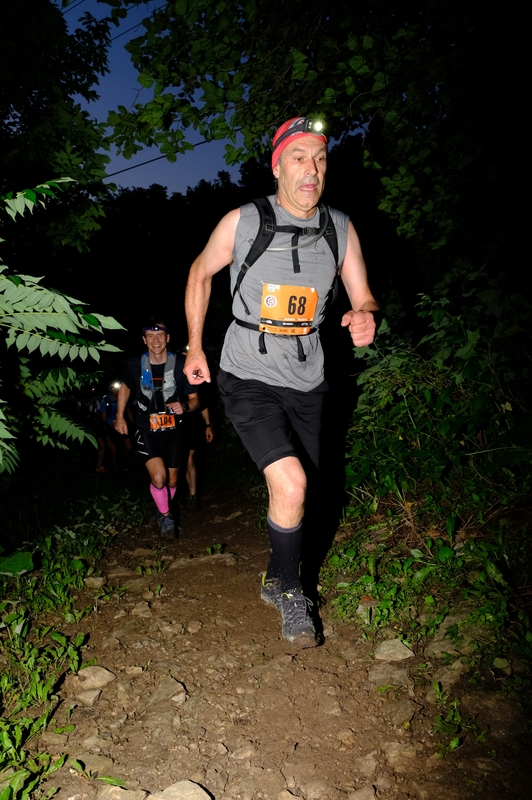 I only bought a decent brand name headlamp two days before the race. I have never experienced nighttime trailrunning. When we used them at the beginning of this race, I loved it so much. There was a peace and calmness running the first part of that course in the darkness that was amazing. 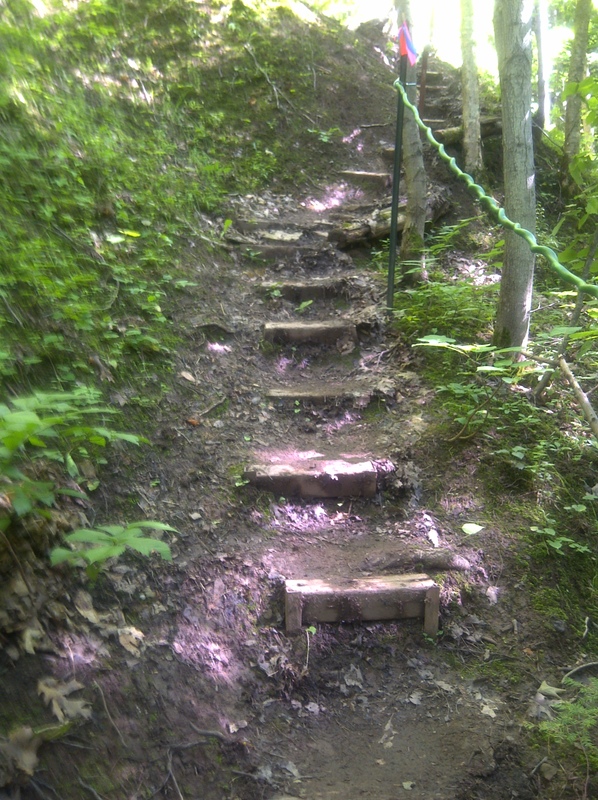 For the few hundred metres after the starting horn runners were positioning themselves, and then it was single file up what is known as the “Grind Trail” which goes up what is known as the Niagara Escarpment. The birds were awakening to the new day with their songs. The string of headlamps which twisted and turned up this trail was breaktaking. With no thoughts of what may lie ahead on the course, I was thinking how fortunate I was to run in a race like this. To compete. To be alive. I have a handful of close runners who are such great support with my running. Kristi is one of them in which we follow each other on Twitter. Coming up to this race, even though we hadn’t run together in person all year we were still encouraging each other right up to race day. When it comes to ultrarunning races, she runs them extremely smart and disciplined. She handles adversity with a calmness. And just knowing she was out there on the course was a huge boost to me. Love this photo of Kristi’s family. Kristi ran the 50 miler. Her husband Michael and two boys Evan (age 14) and Luke (age 12) ran the marathon relay. Evan ran 2 laps. On this course this is absolutely amazing! Photo courtesy of Kristi Raz. I got separated from Kristi during the first half kilometer while runners were positioning themselves before the long single file climb up the Grind Trail. I never saw her again on the course, but she is a warrior. I knew she would keep going until she finished. This in itself kept me going. One of the things I love about these races are the people you meet. Each have incredible stories of strength, courage, determination and inspiration. 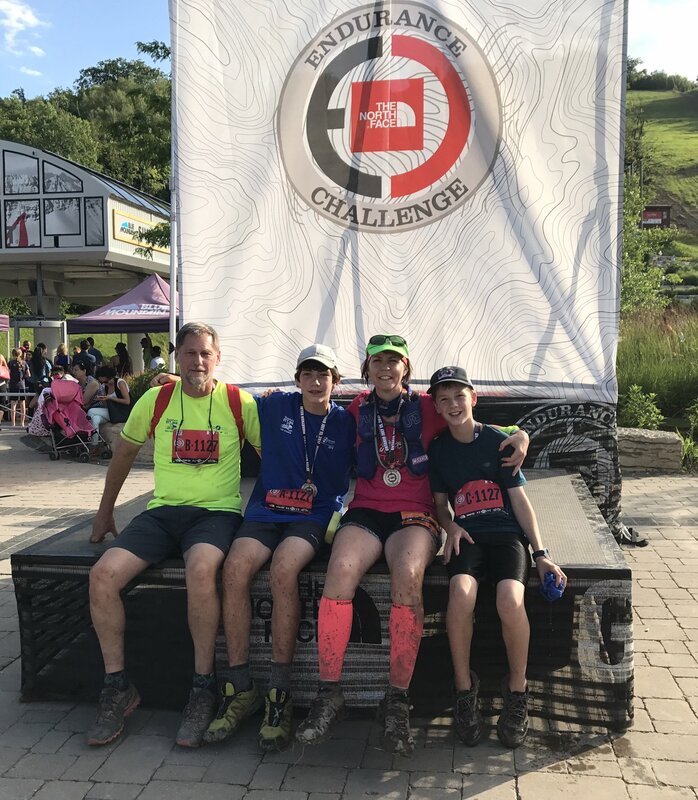 There was Peeter, an elite runner who drove up from Connecticut to compete in his 3rd 50 mile North Face Blue Mountain race in a row. Peeter burned up the course in 10 hours, finishing 24th overall. Some runners I would run with just for a minute or two. Others like a young man named Tom, I ran close to an entire stage between stations with. He was young, fast and agile. Running with him on those non technical cross country ski trails in particular I was able to gain some valuable time against the cut off clock. Other times conversations with other runners were a bit more subdued. Such as with one runner I had walked a short distance with who had reinjured a previous injury and was limping badly. His race would be over once he made it to the 15.5 mile aid station. Never have I been in a race where proper gear could have a deciding factor. With only two 10 kilometer non technical trail runs to try them out, these new trail shoes were pretty much untested going into the race. This is why I put my other shoes in my drop bag in case I needed them. But my new The North Face Ultra Fastpack shoes performed flawlessly. You would never know it, but these shoes had only 20 kilometers of use coming into this race. In that clay mud that builds up on the shoes my shoes did slip and slide a lot. But some runners were sliding around much worse than me. Not only does it put the runner in more of a risk for injury, it becomes a morale buster when more sure footed runners are going past them through those long muddy stretches. What the shoes actually looked like before the race. Add to the fact that I was running for over 13 hours with wet feet and finished with only 2 blisters (which I did not know I had until after the race), and no black toenails. The biggest thing of all is I stayed up on my feet the entire day. No falls. Jodi and her husband. Little did they know that this married couple were angels in disguise to help me make it to the finish line. Jodi was running the 50 miles, and her husband had the permission to pace her the final 10 miles to the finish line. I was tediously slow on the technical during those last 10 miles and Jodi and her husband would go past me. 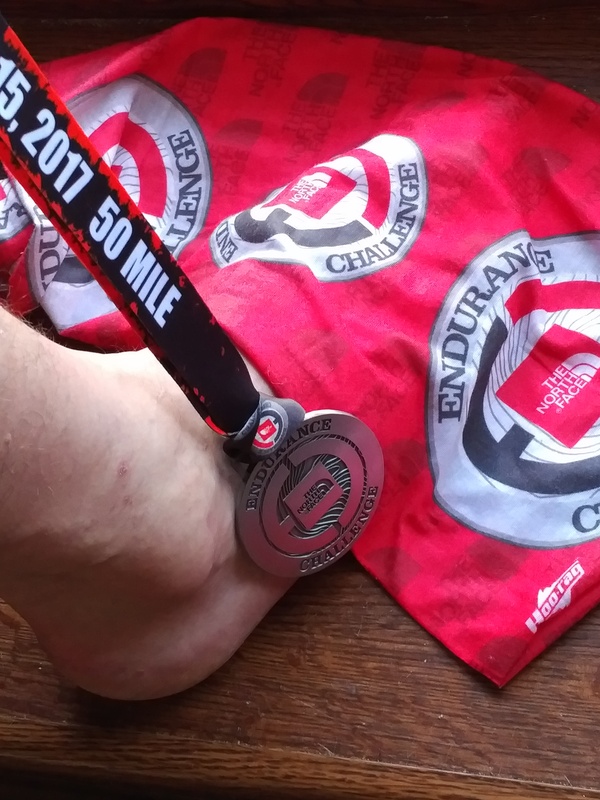 The wear and tear was deteriorating my ankle further and further as the race went on. Then on the less technical sections I would pick up the pace and go past them. In one direction or the other we had to pass each other at least a dozen times. There would be small bits of conversation each time one of us went by the other. Just having them nearby was a huge comfort and strength to me. After a few seriously steep ski hill climbs I came across a race volunteer and asked “How much further?” He mentioned “three kilometers to the finish line”. I can’t say enough for all the race volunteers. They were all incredibly AMAZING! One more major climb, some smaller hills and then straight down that downhill ski hill (where I aggravated the ankle on the 1st loop) to the bottom. Taking a 90 degree turn, it is then a flat dash to the finish. It was an extremely long gruelling day, and after 13 hours, 10 minutes and 4 seconds (50 minutes before my cut off) I crossed that finish line. Walked around for a few minutes so I would not seize up, then I sat down to text my wife to let her know I finished. My wife had race updates of my progress on her phone, and she knew I finished. There was a message waiting for me from her congratulating me. It was only then that the tears began to flow. I had just finished the world renowned North Face Endurance Challenge 50 Miler under the most gruelling conditions the course has ever seen. For the next few days after a big race runners will often be thinking about their race day. What worked, and things that need improvement. For those who did not finish, there would be so much soul searching of what went wrong. They would be haunted by what is known as that “unfinished business”. And in a gruelling course of this distance that puts so much stress on the body there are so many variables that can go wrong. There can be heat stress, body fatigue, dehydration, gastrointestinal issues, electrolyte imbalances, a recurring injury, a new injury on the course itself and so much more. Taken by my ultra running friend Kristi Raz, prior to the 5AM start. So many things could go seriously wrong during these long races. You just never know. At 59 years old years old I was the second oldest runner to finish, which is very humbling. But how was it that 35% of the runners who started the race did not finish? It was not that I trained better, or was more prepared because I felt so under prepared for this race. The vast majority of these competitors were younger, in better physical condition and likely had much more ultrarunning experience than me. I learned a lot a things about this race experience. And the biggest thing I learned is “never, ever judge another runner”. I was desperately fighting my own battles, and each runner was fighting their own. Each runner was running on a very fine line of whether to try and finish or pull themselves off the course. And from talking to other runners and reading some race reports I certainly would not want to running in their shoes with what they were going through. I have SO much respect for every runner who stood at that starting line at 5 AM. After our race I joined Kristi and her family for something to eat. A lady named Robin on the 50 mile joined our conversation from the table beside us. Robin and I ran together off and on with around 10 miles to go, and I wasn’t sure why but she fell behind. It turned out she blew out a shoe and literally finished while running on fabric. Another runner from another table beside us joined our conversation. 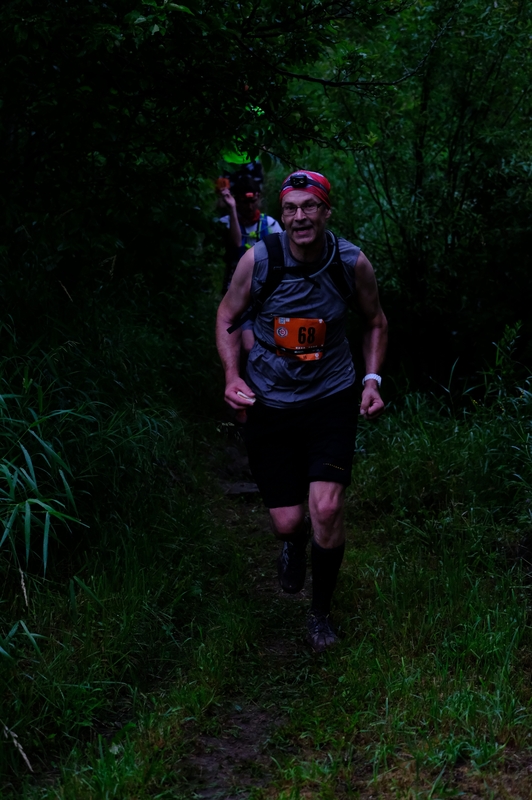 An extremely experienced ultrarunner, he finished 20th overall in the 2016 one hundred mile Sinister 7 (a race that only sees 20% of those who start finish). 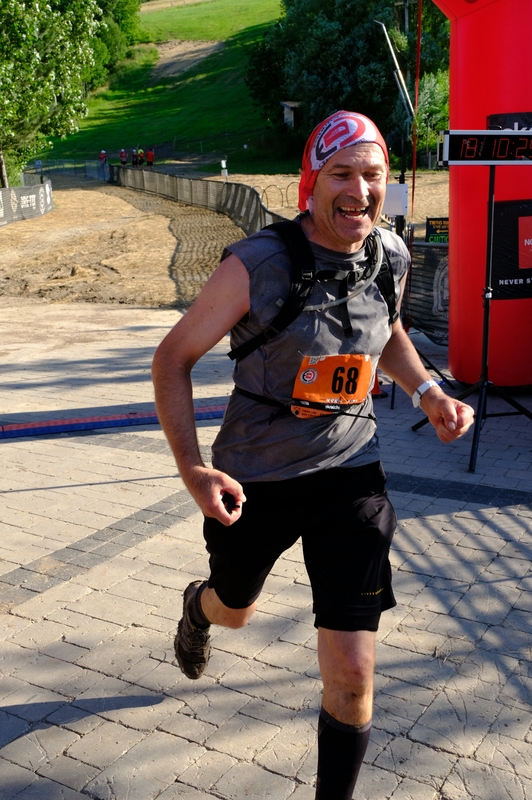 But in our 50 mile North Face race he got violently sick, which brought on dehydration and extremely painful leg cramps. It took time but he was able to get his water and sodium/electrolyte back in check enough to finish. I have so much respect for my niece Caron. We have run 2 x 50k’s together and train a bit together. 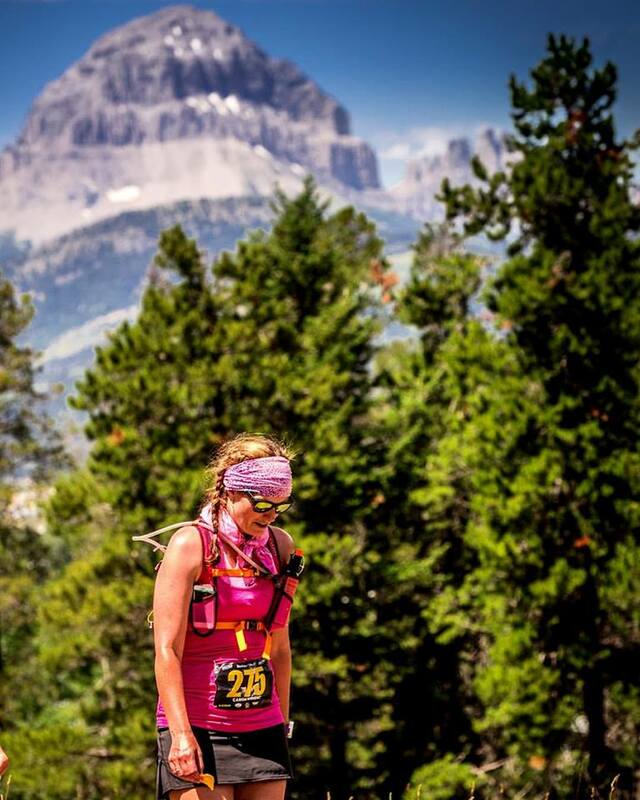 Photo taken by Raven Eye Photography as Caron was coming off the course at possibly Canada’s toughest ultra race, the 100 mile Sinister 7 in Alberta. It is a race that sees 21,000 feet of elevation gain, 21,000 feet of elevation loss (only around 20% ever finish). It was held just the week prior to my North Face race. Caron had a nasty fall. Would have been such a difficult decision to come off that course. Not one to normally post “foot photos”. The foot was pretty gross after the race. This is 3 days later. The normal colour has returned and a lot of swelling has gone down. There are a few elite ultrarunners that I have an incredibly deep respect for. One such runner is John Kelly. John was the one lone finisher in the 2017 Barkley, he was only the 15th person to finish since it started in 1989. I follow John’s blog. He will kindly answer my questions and share his thoughts and suggestions. For his achievements he is an extremely humble down to earth man. His last post was called “The Goldilocks Difficulty“. It could not have been more timely. I read this just the day before my race. He talked about “adaptive goals”, and his advice became extremely helpful to me for finishing on race day. A previous post was called “Failing With Purpose“. It was summed up in the beginning of The Goldilocks Difficulty post where John quotes, “I advocated for setting stretch goals where failure is a likely outcome. I still believe that more benefit can be realized by falling short of a stretch goal than by overachieving on an easy one”. 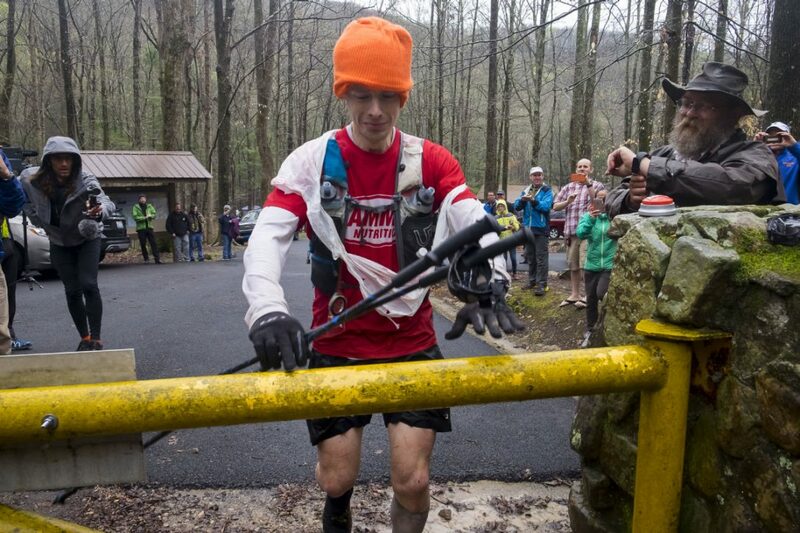 John Kelly, an ultra-runner whom I have so much respect for becomes the 15th finisher in 28 years of the Barkley. Image source Toronto Star. 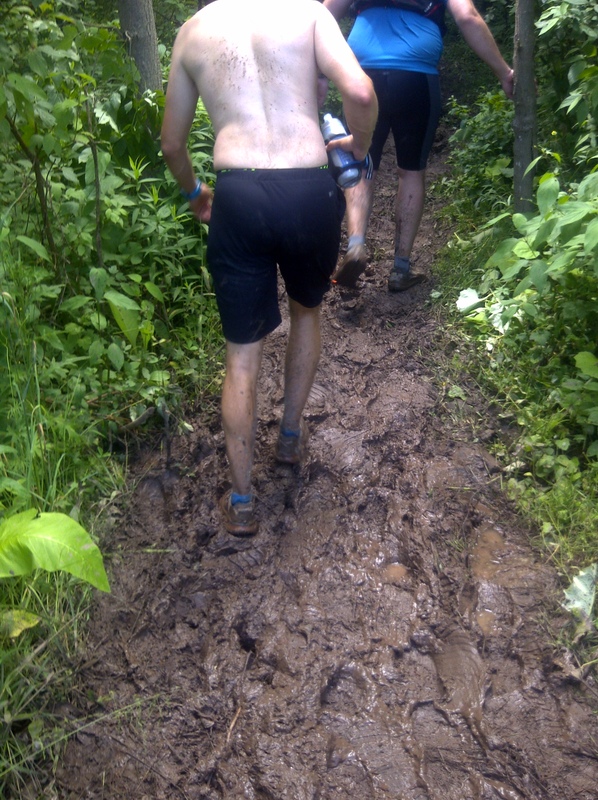 I love ultra-running and the challenges it offer. I love the ultra-running community. There is such amazing support, camaraderie and encouragement that comes right up to the elite runners. And I know that as my races become even longer and tougher, there will be a stretch goal where I am going to fall short. It will happen. The toll on my body from this last race was huge, and recovery in my 59 year old body is taking longer that I had hoped for. So still undecided what my next big race goal is going to be. Until then I will enjoy a few non training days in summer and then start planning for the next big one. Blog for an Average Runner Written by Kristi Raz (whom I mentioned frequently in this post) Kristi is much more than average. Her description of the physical and mental challenges are right on the mark. This was Kristi’s 1st 50 miler (80 kilometers). And what does she do when she arrives back home? She registers for a 100k. Absolutely amazing!!!! Running Every Day The blog title refers to a runstreak that the author Mike has going which has now surpassed 1500 days. That takes such a tremendous amount of discipline and endurance. Mike was coming into this race with lower back pain, I can’t imagine what it would be like running in his shoes when that pain was screaming with intensity during the race. He tried to continue, but at the 56k mark Mike’s day was finished. So much respect for sharing such a brutally honest post from the heart. Run Bike Throw Though not an actual race review, the start of the post however gives a “shout out” and a picture to 3 of the 50 mile finishers names Alan, Farsad and Paul. I don’t recall any of them all day on the course. Alan is the runner in the center of the picture (who appears to have changed out of his running clothes). He finished third overall in the male category. So well done to each of these guys! You really were incredible out there Carl. What an accomplishment! Thank you so much for your kind words. I hope we are at another race together soon. It makes the experience even more special when meeting with friends. Take care of that ankle and rest so you are ready for whatever your next running adventure may be! Thank you so much Kristi for all your support. You are such a consistent and disciplined runner and I have so much respect for you. Having friends at these race events really does make the event so much more special. Ah, my old blog buddy, I was happy to see a post from you and I was on the edge of my seat through the whole story. I went through a time in my late teens when I ran daily and even though that isn’t possible now, I remember what that felt like. I gained so much from this–even though I am not an athlete, I have my own goals and struggles and after reading this, I have a new resolve to complete them. Congratulations, Carl! Wow, entirely WOW! Carl, my heart is warmed when I read about your adventures, knowing the reason why you took up running in 2013. You are incredible and I am forever grateful! Congratulations. What an incredible feat!! I can’t imagine running that race but I’m so impressed that you finished it. Take care of the ankle. Again congratulations!! Joseph Bull here, completed my own bucket list marathon trip several years back – 1800 km non-stop in 20 hrs. Just about froze in first leg, got pulled for speeding in second leg(wasted 20 min but nice guy let me go with a warning) then hung up in weekend trafic on final leg. So antsy and cold in last few hrs could hardly sit on the bike. But I tell ya that was nothing compared to what you just did. You were just brutal on yourself. At least I got to sit down the whole trip. You rock. Judy thinks so too. Impressed with your achievement. Joseph, thank you so much for sharing this. I LOVE hearing about the passions and adventures of others. That is such a huge distance that you covered on your motorcycle. There has been a few times over the course of my lifetime where I considered getting my motorcycle licence, but it never went any further. Admire you that you had those dreams, and then went on to fulfill them even when it got so cold at the end of this massive trip. Something about pushing one self, and achieving that dream that makes life so amazing. Carl. You are an amazing man, and I truly respect the courage and endurance that you have!! Congrats Carl!! Found your blog today and enjoyed reading the race recap! I’m training for my first 50 miler in November – yikes! I’m so afraid of failing – nagging right knee issues. So happy for you – great job. Rest now! You deserve it. Keep blogging – and logging the miles. Suz, thank you so much for reading and sharing. The “yikes” was exactly what I was thinking before my 50 Miler. You’ll do well. The weather in France should be a bit cooler for you. I know you can do this. We are back in the hot and humid states now. My biggest challenge is going to be getting up early to do the long runs. I’ll be watching your blog for inspiration. I imagine the humidity would have really hit you hard after time away Suz. I was considering registering for a 100k in Quebec on August 19th. My runner friend Kristi registered for this right after she got home from The North face race. The training miles would be already “in the bank” after this past race. Just 2 or 3 long runs and a taper and you’re good to go. I’ll have to do a half in Canada sometime – it’s a beautiful country. I have done the Detroit marathon which is an international marathon as it goes over the Ambassador bridge to Windsor, Canada and back to Detroit via the tunnel. Pretty cool race and medal. Here’s to a healthy week of running – Cheers. Carl, First: Congratulations on an incredible run! 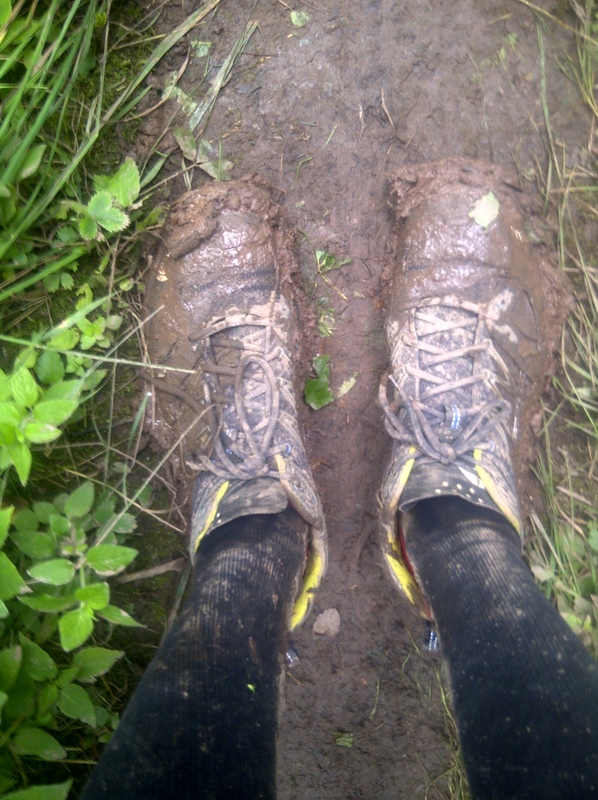 Also, thanks for the awesome write-up of your experience on those hills and mud. I hope the ankle is returning to normal, and I’m looking forward to hearing what you have chose for your next big challenge. Like I say, you never know….I might show up at the start line alongside you! Thank you so much Daniel for reading and for your very kind words. The ankle is healing. Still haven’t been out running in the 8 days since the race. The body is ready, but the ankle says “no”. But that’s okay. Out for a good bike ride yesterday though! Thank you so very much for your kind words Fleck. So many runners found it such a tough day, but sure glad I went the distance. Many congratulations! Nice recap. Hope you are recovering quickly and enjoy your break. Positive attitude and determination ooze out of your article. Well done and absolutely inspiring! Carl, congratulations on pushing through all of the challenges, not quitting and finishing the race. It is an amazing feat. Good race! Wow! You are a star runner! I can see how your blogging life is translated into real life, and think that you’d definitely have a magnetizing personality for people you encounter with. 🙂 There are a lot of very fine lines you have to consider running and continuing on to cross the line, and you still persevered. Amazing, and Congratulations! BTW, This is the first time I heard about the drop bags so thanks for that. Thank you so much Rommel for your extremely generous comment. You are so very kind. Drop bags are something pretty much exclusive to the ultra marathons (distances longer than the marathon). I have been in races that were 50k (30 miles) where we could use them and in this past race only the 50 miles runners were allowed a drop bag. Each race has their “specifics” with size and weight. 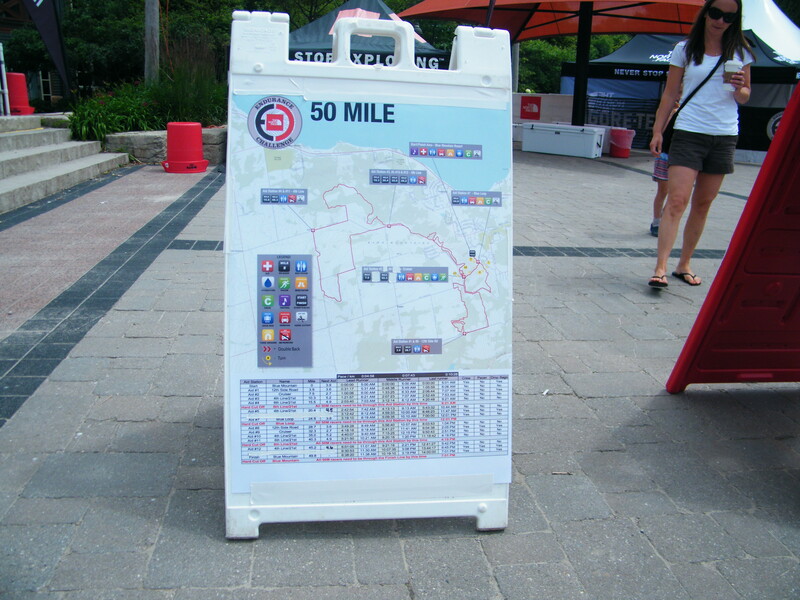 Some races you can choose which aid station you want your bag dropped off at. Other times all the runners drop bags go to one specific spot. And in the even longer races like 100 miles sometimes you are allowed more than 1 drop bag. Planning the logistics before these long races can be a lot of fun in itself. Amazing run. I am speechless. Congratulations. Congrats on finishing! That is absolutely amazing to me – I can walk all day, but the idea of running a mile or two is incredibly daunting. I can’t even imagine doing 50 miles! Thank you Sarah so much for reading and your kind comment. That distance was really daunting for me. Particularly when I hit 1 mile, and I’m thinking I got 49 miles to go…lol. It’s helpful to me that there is someone else involved – someone who doesn’t get to go out if I don’t go with her. I think there was a study a few years ago suggesting that dogs are a much better motivator at getting out for walks and exercise than other people are. And I wouldn’t be doing it at all without you pointing me to Caron’s challenge for herself! I was just talking to a person yesterday who mirrored exactly what you said about her dog being that motivator for getting out for her daily walk. How cool is that, that you watched the Barkley Documentary. The race does have such an incredible appeal and magnetism. Everything about it is so challenging, even figuring out the registration process. I have read a few newspaper write ups on this past years Barkley, this Esquire magazine link was sent to me a couple of weeks ago by winner John Kelly (to expand, not just me…I’m on his group e-mail list…lol). Still always amazed how humble he is, but he introduces it with these words “This is a long-awaited feature on the 2017 Barkley Marathons in Esquire. The author, George Pendle, was a pleasure to speak with and is an extremely nice guy who I know wanted to to portray the race as accurately as possible. Overall, it’s a great article. With today’s editing and sensationalized headlines, though, it should be no surprise what appears on the first page and the title that was chosen”. Thanks for forwarding this! I am going to read it here shortly – it really is a fascinating race at so many levels. It was an excellent article – and a good follow-up to the documentary. Thanks Sarah, it really gave a sense of what these runners face. The cat looks right at home 🙂 Perhaps she would like to join in? First of all… That is brilliant. This looks to be a really tough one and messy – which really does take a mental toll. It really is a kind of roughness that goes beyond “running” and this is where team work comes in. You have had people supporting you (that was a really cool sign!) and there were people on the race – sharing of mental strength would double the physical one. This community you have built is outstanding. Just a question – what kind of a diet do you follow? Running was the first exercise I picked up after recovering from my treatment and the 5K only sapped me in spite of keeping a pretty healthy diet (Took me a little over 35 minutes). Thank you so much Prajakta for such a generous comment. I cannot say enough how wonderful the trail running community is. A lot of support there, plus my family, friends, community and workplace all root for me. It is very touching and humbling. Since I started running I have tried to keep like yourself a pretty healthy diet. But it has only been this past 7 or 8 months that I am trying a diet plan from a book. You mentioned about the cat. I’ve had this book on the shelf, purchased at a garage sale about 5 years ago called “Eat Right For Your Type” by Dr. Peter J. D’Adamo…….http://dadamo.com/ It is an individualized plan that you eat foods best suited to your blood type. I have always been sceptical, so I had not ever tried it. Well the cat knocked it off the shelf which playing on it. I picked it off the floor, and thought “what have I to lose”. The diet more targets heart health, which I always struggle with. When I started running I had high blood pressure. Running and eating better brought it down to high/normal (that area between high and normal).. After 2 months on this diet my blood pressure dropped like a stone.. For the past few months it has been a constant low end of normal. And for being 59, this is really exciting. I also have more energy, and I am sleeping much better. Foods are grouped into 5 categories…super beneficial, beneficial, neutral (allowed frequently), neutral (allowed infrequently) and avoid. What I try to do is eat foods that are super beneficial for my Type A blood type and avoid foods which are listed as avoid. Avoiding some of the avoids have been hard. Bananas, potatoes, oranges and tomatoes are 3 of them. I still treat myself now and then. With my results I will likely keep this diet for a long, long time. Ah! The subtle signs provided by the all-knowing cat 😀 Thanks for the sharing the diet plan – I have heard about this particular one so much! Unfortunately, I am Type A too and the four foods you listed happen to be some of my most favourites (being a vegetarian really limits my options). But I am so happy how well you have adapted AND responded to the diet. Let’s see what it has to say for me. I have upped my protein and fibre intake, and the results are showing in my strength and stamina 😀 Hoping for further progress. Although I have not gone totally vegetarian Prajakta, I have cut back drastically on my animal protein since I started this diet. The book mentions that blood type A lacks some of the enzymes and stomach acids to effectively digest animal protein and recommends you should derive your protein from non meat sources. It continues that animal protein consumption can aggravate Blood Type A tendency toward high LDL cholesterol as well as accelerated blood clotting. which can cause arterial damage. Given my family history of heart attacks getting my protein from non meat sources has probably really helped my blood pressure. The best source of protein for type A blood is soy based protein. Thank you so much 😊 I think it’s time to re-examine and make tweaks to the general diets… Wean back instead of shocking the body! I have (and continue) to accomplish many physical things in life….I will NEVER achieve the endurance or willpower to pursue such a challenging task. I applaud your drive and commitment to all you’ve accomplished in life. The the many successful days in front of you bring even much joy and happiness to your life. 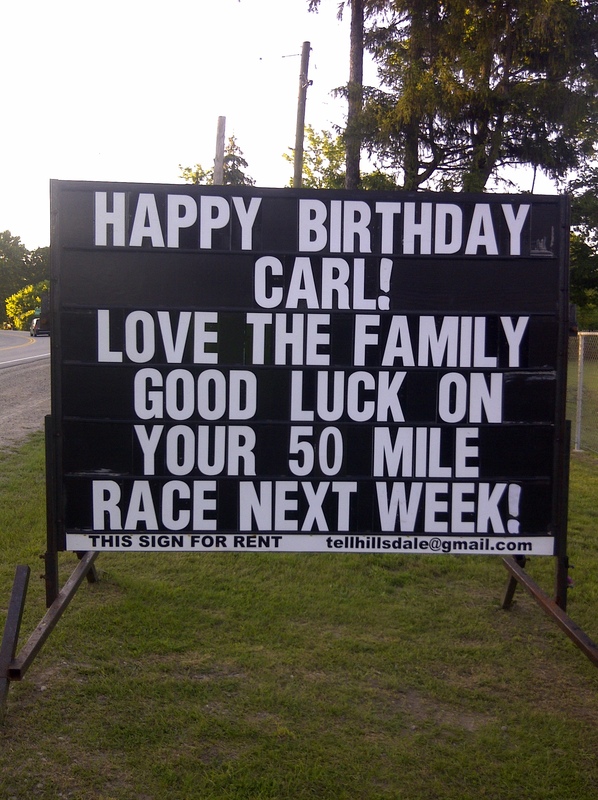 congrats on the 50 milees- woo hoo and LOVE the sign your family made for you. just kidding – god bless you in all you do – on the field and off…. Aww thank you so much Yvette. There were a few times I had to push the thoughts of quitting out of my mind. Crossing that finish was a feeling that is so hard to put into words. well thanks for the nice reply – I have thought of you every time I had walnuts this week – ! !